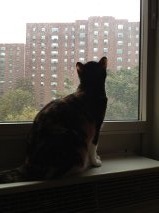 FOSTER CAT "RORY" WATCHES HURRICANE SANDY LASH INTO MANHATTAN'S EAST SIDE. RORY (a.k.a. "ZILLY") IS ONE OF THE LUCKY ONE'S. RORY WAS RESCUED BY NEW YORK'S ANJELLICLE CATS AND NOW HAS A WONDERFUL FOSTER HOME WHERE SHE IS A MUCH ADORED PET. Thanks, Caren. I feel the same way!